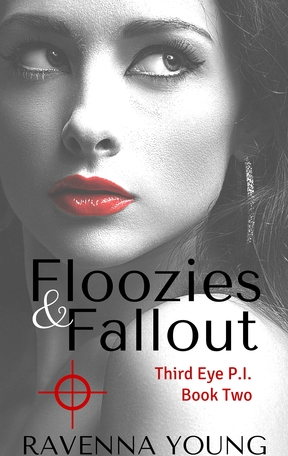 Floozies & Fallouts is the second book in its series. If you have read the first book then you will be pleased to see Cassie's horse loving, best friend, Eryn, is still around. Eryn's brother Ben, also makes a return, who Cassie is still messing around with. One of Cassie's dreams is giving her trouble because she can not see who really killed Dillon. But when she dose finally see who did it, she is shocked. This book follows Cassie, a physic private investigator, into a world of pole dancing. Cassie needs to find out just what is going on behind the clubs doors. What are Rayan's intention? As a chick lit writer I like to read other genre's. Ravenna's writing style is uncensored and raw, this is why I like her. Her writing does not fit the norm and her charters are unfiltered. The character view point tends to head hop, but I quite like that, it's raw. The story is fast moving with lots going on and you don't get to see Cassie's inner-feelings that much, but to be honest, sometimes its just nice to read about the story line and not bother so much with the main charters deep and darkest thoughts. I like this author and even though her charter Cassie is shockingly cray cray, I find my self really liking her. She is a young girl trying to find her way in life.